Ahhh Fall! What’s not to enjoy? Isn’t this the best season of all? I enjoy fall time as the leaves begin to turn, weather becomes cool and pleasant, mornings are crisp and the fall rains start to moisten the ground. Gardening chores are at a low roar. 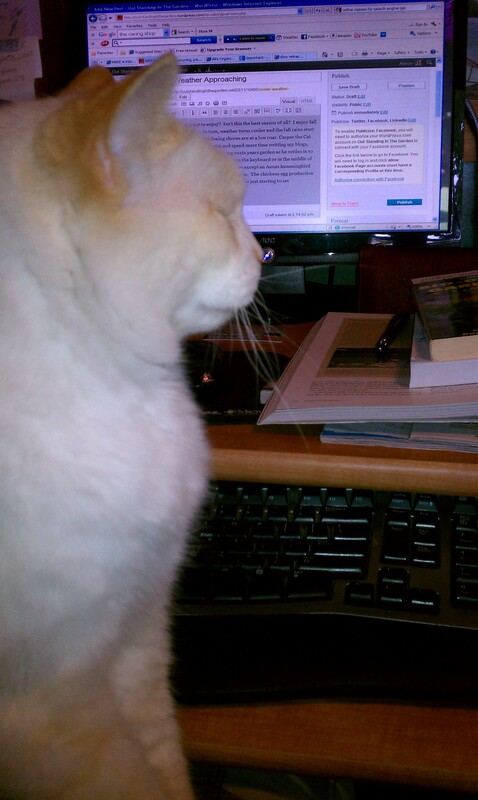 Casper the Cat enjoys when I start to slow down and spend more time writing my blogs, studying gardening books and planning next years garden as he settles in to add some assistance by either sleeping on the keyboard or in the middle of the my book. The hummingbirds are gone except an Annas hummingbird that stays over winter here on our little farm. The chicken egg production is almost up to 100 percent. 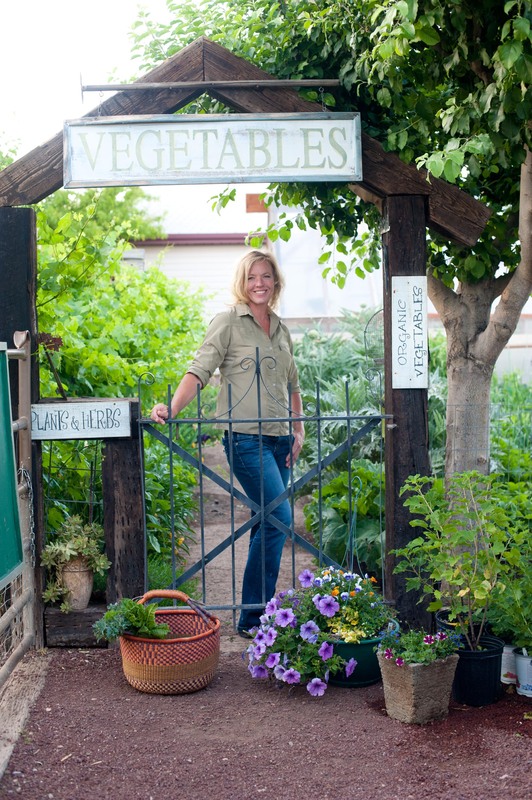 Fall crops are just starting to set and just a few weeks out for fresh new greens. It’s time to harvest the sweet potato crop before it freezes. Garlic, leeks and shallots will be planted this month. Pretty pansies, snaps and chrysanthemums are blooming. 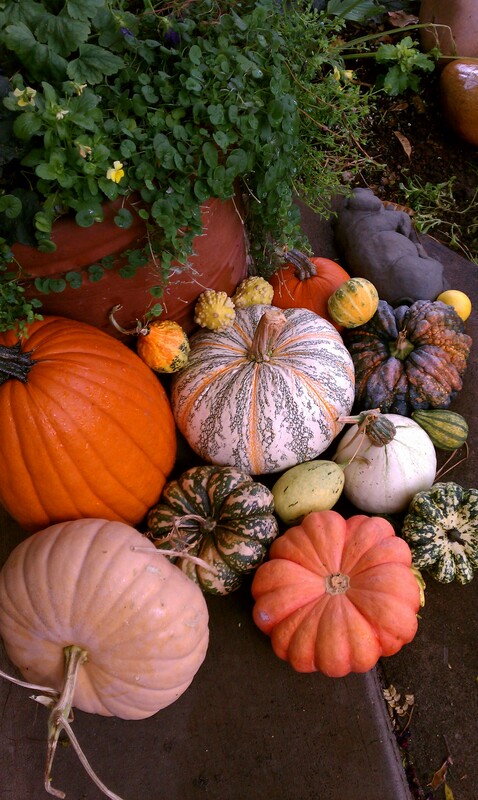 Pumpkins, pumpkins, pumpkins……. And the smell and sounds of fall! Wouldn’t you agree? This has to be the best time of year! This is the time of year I love to cook and create foods that make you feel good inside. Pumpkins are abundant during autumn and I love to decorate with them as well as cook with them. 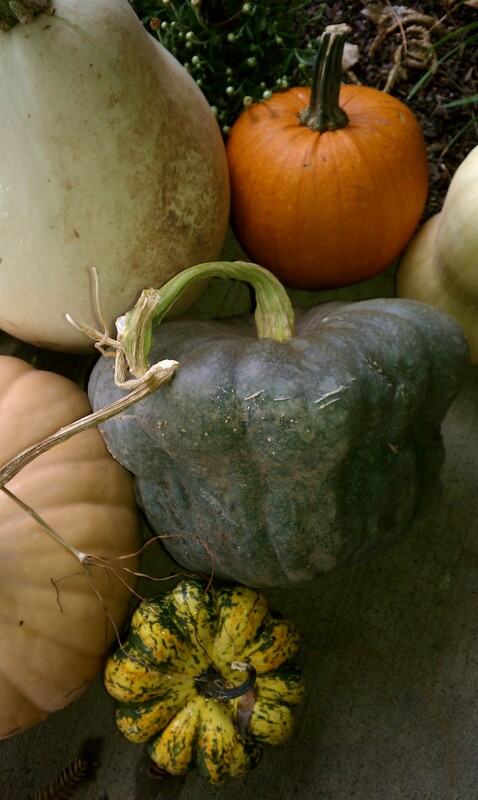 Heirloom pumpkins are really just a pretty squash that taste great. If you didn’t grow any this year check out your local farmers market and grab a dozen or so! They are loaded with vitamins and minerals and they last for several months in cool temps. Here is a simple and great side dish perfect for fall! Ingredients: 1 1/2 lbs pumpkin, 1/2 freshly grated parmesan cheese, 2 T dried breadcrumbs, 6 T finely chopped fresh parsley, 1 1/2 tsp finely chopped thyme, grated zest of 2 large lemons, 2 large garlic cloves crushed, salt, white pepper, 1/4 cup olive oil, 1/2 cup sour cream, 1 T chopped dill. Cut pumpkin into 3/8 inch thick slices and lay them flat on a baking sheet that has been lined with parchment paper. Mix together parmesan, breadcrumbs, parsley, thyme, half the lemon zest, garlic, and a small amount of salt and pepper. Brush pumpkin with the olive oil and sprinkle with the crust mix making sure to cover all the pumpkin. Pat the mix down to hold it in place. Place the pan in the oven and roast for about 30 minutes or until tender. If crust darkens too much you can tent with foil. Mix sour cream with the dill and some salt and pepper. Serve pumpkin warm with a sprinkle of remaining lemon zest and a dollop of sour cream on the side. You put it beautifully! I love fall! As I’m sitting here freezing, your blog makes fall look great! Fall is not bad, at least life slows down and I am not sweating anymore.